The Law requires you to provide a disposal system of sanitary products for females in your establishment. It states that the waste systems should actively control odour and fight bacteria. The removal and disposal of these items must be completed by a registered waste carrier. 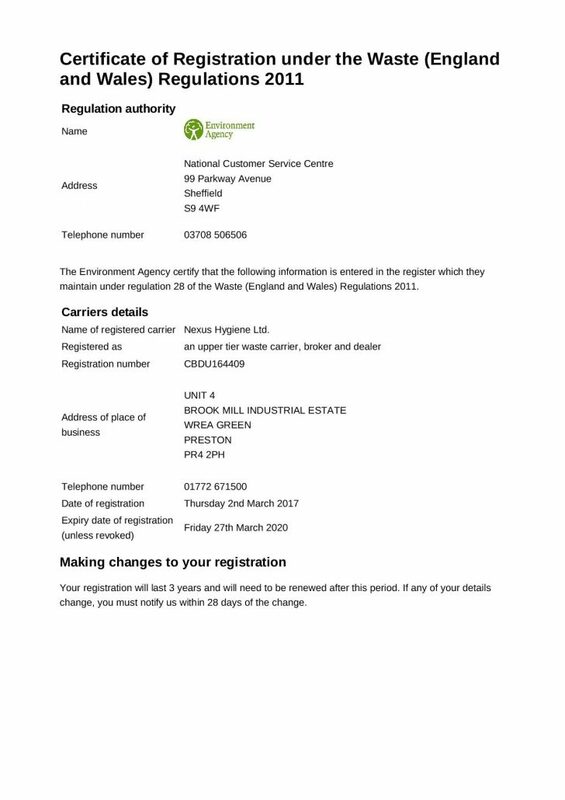 Nexus Hygiene Ltd is a Registered Waste Carrier approved by the Environment Agency to help carry out all your legal requirements under the approved code of practice, Workplace (Health, Safety & Welfare) Regulations 1992. As an Employer, under The Environment Protection Act 1990 you have a Duty of Care to ensure that all washroom waste products are managed until the final stage of disposal. In addition to your legal responsibilities, the condition of your washroom facilities can impact upon your employees’ well being, morale and customers’ perception of your business.